Thin-Walled Maze Polypore (Daedaleopsis confragosa) is a common, widespread, bracket fungus. It is found year-round, alone or in groups, on logs and stumps of dead hardwood trees. It is rarely found on oaks or conifers, and rarely found on wounds of live trees. The description of this fungus sounds similar to many bracket fungi. It is brownish or grayish, stalkless, fan-shaped to nearly round, thin, and has concentric rings (zones). 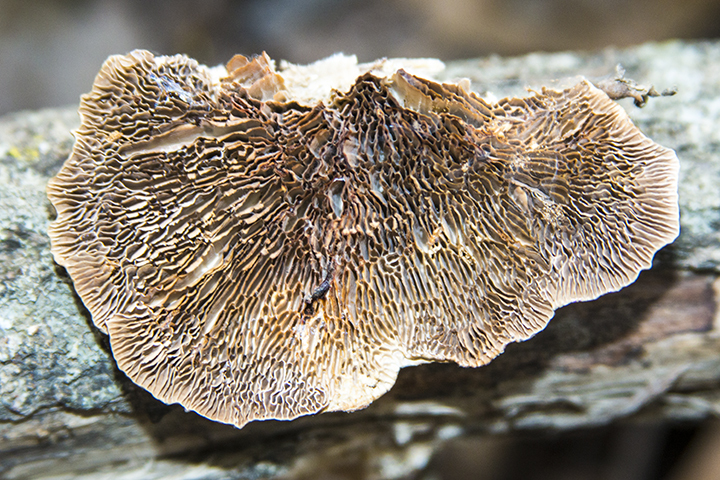 The most distinguishing feature of this fungus is the elongated, maze-like pores on the underside with thin walls. This entry was posted in Fungi and tagged Daedaleopsis confragosa, Thin-Walled Maze Polypore on October 18, 2015 by John Valo.